Yesterday morning as I went home from work, I have not felt any exhaustion from the shift but a lot more nerves building up. 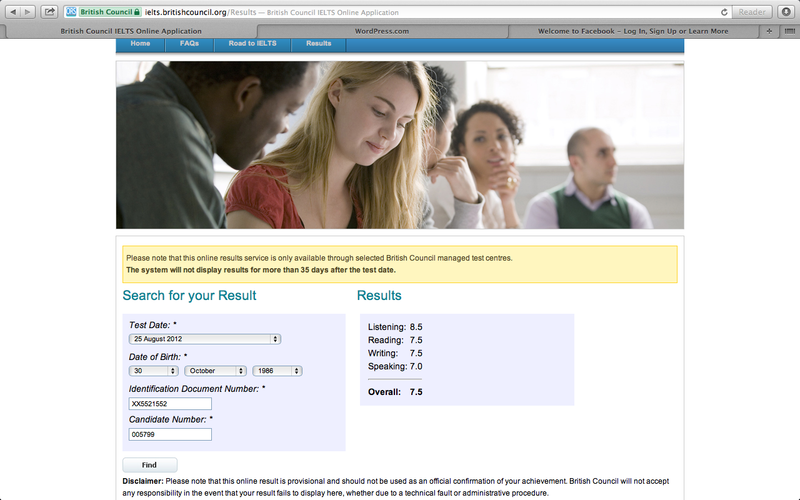 Last August, I took my IELTS examination. And that day was the reaping of the harvest. My heart was beating like an 808 drum as I open my laptop. After several attempts to check the result, still no results have been shown. Then, I tried again. To my horror, I saw my scores. It was so surreal! I prepared for this for almost two months and an outcome of my preparation is this blog. This is like a validation that I do not just write simple nothings and that I can really write something. My heartfelt gratitude to World English Reviews for honing my skills and for being so generous. I also owe this success to blogging and Wordpress for being a vehicle to my thought content. To all who prayed and helped pave way for this triumph, thank you! To God be the glory. Cheers!